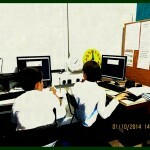 This entry was posted in Coding, Coding: Scratch and tagged Coding, Coding: Scratch. Bookmark the permalink. Thanks for the links to the Hour of Code website. Some of the students at our school worked through some of this last year and I had forgotten how good it is for beginning coders. 5/6 CS are exploring Scratch at the moment and just before the term break they created some projects about rotation, reflection and translation. We shared some of these on our class blog. Next term we will be exploring Scratch further. Your description of the art activity is intriguing. What did you create? I am reassured you think that Code.org’s Hour of Code and follow up is good for those who are starting to code. I am happy with it myself, but I’d always be thinking perhaps there is something else out there for beginning coders that I overlooked. I had seen your Scratch projects on your blog. Starting out as we are ourselves, I was very taken with what can be achieved and the integration with maths. That was the really lovely thing about these Scratch areas, there the students are working happily and trying to work out distance and angles. It is worlds away from exercises in their copybooks. Our art activity was creating flowers using the repeat block and making loops. Because you understand Scratch you know how easy it is to create lovely effects very easily. The students were fascinated by movement on screen and the random colours. They were so engaged I didn’t have the heart to take a screen shot and post it. But I think it would be a useful objective if I taught them to take screen shots for lots of reasons. Thanks again for visiting our blog. We get mid term in three weeks and Autumn is just arriving with its wind and rain. 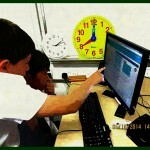 We hope to post the work we do using Scratch shortly.